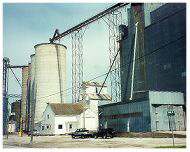 The Shellsburg Elevator consists of a main location in Shellsburg, and two additional branches located in Atkins and Newhall. The first elevator was purchased in 1992 and the remainder have been acquired since. The goal of the Shellsburg Elevator is to provide competitive and efficient grain services to the area farmers. The primary services offered are grain storage, drying, trucking and vac'ing. The total storage capacity of all locations is 2.48 million bushels in steel and concrete structures. All of the facilities are fully staffed during the fall harvest season and offer extended hours to accommodate the additional influx of grain delivered. All questions relating to the services that the Shellsburg Elevator provides should be directed to the main location by calling 319-436-2251 or 1-800-637-3520. Click on the picture below for more information and prices.